Nina Swidlerdied after a brief illness while visiting her family in Los Altos, California from her home in New York City on January 4, 2017. She was 84. Swidler was born in Washington DC. She attended Columbia University, and earned her PhD in 1969, a year after she joined the staff of Fordham University’s College at Lincoln Center. She continued to teach at the College for more than 35 years. During her graduate studies at Columbia Swidler worked with Conrad Arensberg, Margaret Mead, and Morton Fried but it was during Fredrik Barth’s year-long visiting professorship that the direction of her life’s research was set. Barth had done fieldwork in northwest Pakistan and southern Iran, and he was instrumental in Nina and her husband Warren Swidler’s decision to do their doctoral research in Pakistani Balochistan. The Swidlers spent 17 months there in 1963–1965, mostly in a village in the Dulai Valley near Quetta that they called Sharna. At that time Sharna’s residents were transhumant. They spent summers in the Dulai highlands and winters on the lowland Kachhi Plains, and the Swidlers made the 10-day journey through the Bolan Pass with them by camel caravan. 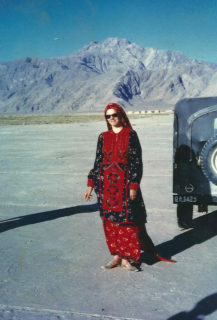 In 1995, Swidler returned for a month-long stay in Sharna while she was carrying out research in the provincial and district archives in Quetta. The Swidlers were among a number of English and North American anthropologists who worked among nomadic or semi-nomadic peoples in southwest Asia in the 1960s and 1970s. While some of these ethnographers focused on ecological and economic issues, her interest was the political economy of “tribal” people at local, regional and national levels. This was to be the focus of her research throughout her career. She published a number of articles on the topic and drew on them as well as material from her fieldwork and extensive work in colonial archives in Quetta, London, and Cambridge University for her 2014 book Remotely Colonial: History and Politics in Balochistan. Published when she was 82, Remotely Colonial uses a critical reading of historical documents and spatial theory to explore the unique location of Balochistan in the British Empire and the legacy this left the people of the region in the post-colonial period. While mainly a historical work, Swidler’s grounding in ethnography means it does not lose sight of the barely visible people in Baloch society (e.g., women and slaves). It was this concern for others that those who were close to Nina Swidler remember. She was an avid supporter of Fordham’s continuing education and adult studies programs and taught many evening classes for those students. She provided generous hospitality to many at her book-lined apartment in upper Manhattan. And colleagues, friends and family recall intense, wide-ranging conversations with her.